You’ve planned your wedding or special party for countless hours and sometimes it seems like an endless task list. You’ve covered every detail, from the start and end times, to the special dances, the toasts and speeches, the cake and the flowers and all of the decisions about food, entertainment, drinks, decor, etc. But have you considered how the event will end? Or, have you thought about how you want it to end? One way to be sure everyone (except the immediate family or wedding party) leaves and that most guests never see the lights come on or the cleanup process, is to have some type of “Grand Send-Off”. Some venues have a strict cut-off time of 10 or 11:00pm and they really encourage a grand sendoff to get people out of the building and off the property in a relatively quick and fun way. 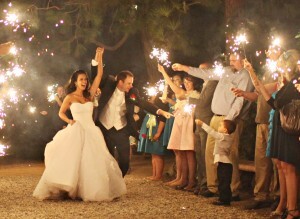 The best way to do it is a “Sparkler Sendoff” where the guests form 2 perpendicular lines, like a tunnel, and light long sparklers and scream and yell as the Bride and Groom or Guest of Honor rushes through the sparkler tunnel and into an awaiting car. If Sparklers aren’t allowed at your venue, see what they do allow…maybe you use rose petals or bird seed or bubbles…I’ve seen M-80 firecrackers once, but I would NOT recommend it again!! Make sure you check with your venue and local Fire Department regarding this issue, and obtain permission and any necessary permits, after all, fire hazards are nothing to play around with. So here’s the big trick to making this work: If you wait until all the guests have already begun to head for the exits, you’ve waited too long. You should listen to your party professionals, most importantly your DJ and your coordinator. If they’re telling you that lots of people are leaving and you’ve still got 30 minutes on your contract, go ahead and wrap it up, don’t just take it to the end because you’ve paid for that extra 30 minutes. If you give a fun, upbeat and finite ending to your party, your guests are much more likely to remember it for how much fun they had, than how tired they were so they decided to leave early. I also encourage the “sendoff”, even if you didn’t rent a limo or decorate a car…designate someone to drive you away from the party as the guests stand and applaud and cheer. After your car is out of sight, your guests will get in their cars and go home with a Big Smile on their face and they’ll remember that moment for the rest of their lives, and so will you! In the old days, the Bride and Groom would leave their wedding well before the party was scheduled to end, and what we found was, all the guests go home shortly after the guest(s) of honor leave, so don’t leave until you’re ready for it to end, but again, don’t wait to the contracted end if you see a mass exodus of tired guests. Never take it personally if guests are leaving before the “scheduled end time”. Some parties have a large percentage of older guests or new parents who have to get home early to tend to the children, so they won’t party til the wee hours. Also if your wedding ceremony starts at 4pm, you have to remember, most people arrive at 3:30, your close family has been up and preparing since early that morning and if your party lasts until 10pm, that’s a long day! Most people are ready to call it quits, so don’t be offended if your party needs to wrap at 9:30 instead of 10pm to get that High Ending I’m writing about. Finally, if your venue makes you end at a time that you and your friends feel is too early, and you’re certain your die hard friends and family want to party all night long, find a place to have an after party. Maybe it’s a bar or club that stays open really late, or maybe if the group is small enough, you go back to a hotel and rent a suite or go to someone’s house who doesn’t have a lot of neighbors and party it up! Either way, you should still heed my advice and end the general party before everyone leaves on their own, then you can take your closest friends and family to the after party. If you trust your event professionals to help you decide the key moment when you should “end” your wedding reception or party, I assure you, it will be much more effective to end on a High Note. Why do you think Michael Jordan retired (the second time after his 6th NBA championship) and Jerry Seinfeld ended his show at the height of it’s success? People always remember them for how great they were, instead of how they fizzled out into oblivion. Don’t sacrifice the energy of the party to milk the last few minutes of your pre-paid contracts. Have a Blast at your event and end it with a Bang! Best Wishes! ← Why Hire a Professional DJ?